I've been busy working on new cupcake paintings all week. Checkout my Etsy Store. I've decided to put all my cupcake paintings there and you'll no longer have to bid on them on Ebay. 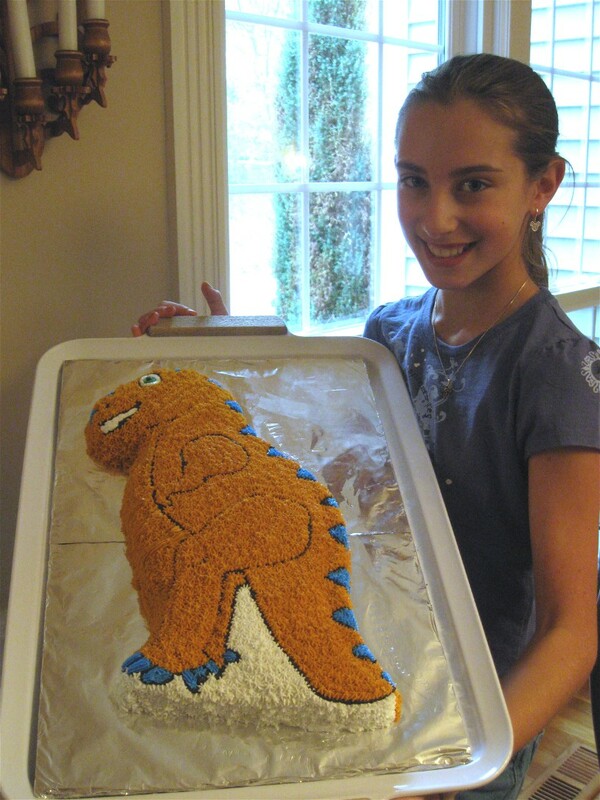 "My daughter, Lindsey, has been baking and decorating cakes since she was only 9 years old. She took her first cake decorating class from a lady in our church 4 years ago and loved it so much she began taking orders from friends and family. She's 13 now and still going strong. She just helped one of her old babysitters plan her wedding cake!" What a cute talented young lady! Lindsey has plans to open her own bakery someday. 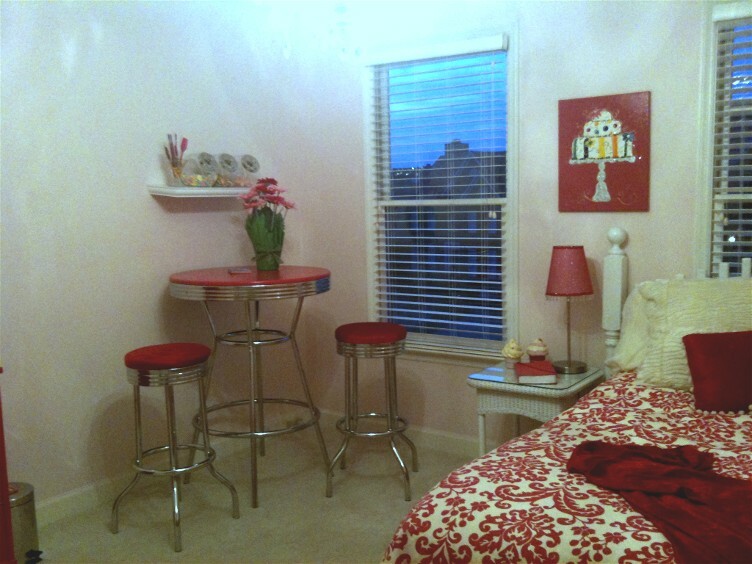 Her bakery themed bedroom is decorated with a great 50's diner set, cake picture, jars of sweets, etc. I love her red and white theme. 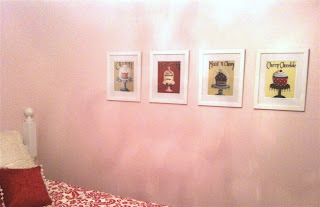 I'm honored to have my cupcake prints in her room. How about leaving Lindsey a message of encouragement to follow her dreams in my commets. Keep up the good work Lindsey! Hi Cathie! 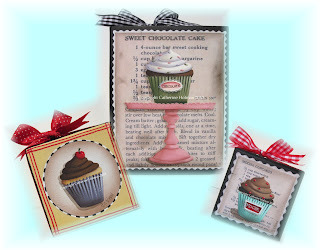 Love all the new cupcake prints! What a talented young lady Lindsey is indeed! Keep up the wonderful work Lindsey!! Wow~! I am really impressed Lindsey! Your cakes are wonderful! Oh my Gosh, she's wonderful. I love her room, and your paintings look great there. How neat. You must still be smiling over that! Wow, Lindsay's cakes are amazing...How nice to get a note from such a talented customer of yours. Your cupcakes would indeed appear to be the perfect theme for her room. Wow, what an inspiring, heartwarming story! Lindsey is one special and talented little girl. How wonderful to have your beautiful paintings in her adorable room. Lindsey is surely talented. How lucky for her that she has found something she'd love to do as a career at such a young age. Keep following your dream, Lindsey! Lindsey surely is talented. How lucky for her (and her customers) that she has found something she'd love to do as a career at such a young age. Keep following your drea, Lindsey! Cute cupcakes as usual! I do hope Lindsey keeps creating her beautiful cakes, she's very talented indeed! How adorable! Lindssey is so talented!! She is a very talented young girl. Lindsey, I am at least 4 times as old as you and I freely admit I CANNOT put icing on a cake, much less decorate it! My mom was the family cake maker so I never needed to learn. You are doing a fantastic job. Keep up the good work and you have a great career ahead of you! Thank you for all of the wonderful encouragement for Lindsey. She loves Catherine's cupcake prints hanging on her wall. In fact, they inspired her so much that she started as an intern in a cupcake bakery last week. A darling bakery with a great mission on Main St. in downtown Franklin, TN. If you're ever in the area stop by and have a cupcake at NatiCakes and say Hi to Lindsey!